A student experiments with different ways of imaginatively and interpretively transforming experience, information and ideas into texts. 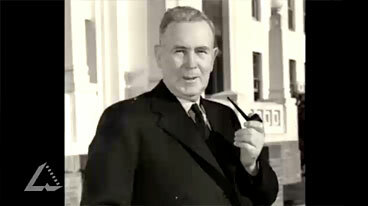 Research the biographical details of Ben Chifley and think about how you might present this as a film or play. Develop a storyboard that shows the key stages of the film or play, with a sketch and written explanation of each stage. Will your play be a broad sweep, or will it focus on a particular key moment? Will it focus on the political or the personal? Will it try to show Chifley as an historical figure, or as someone who is still relevant today? You might then look at a copy of a recent play on Chifley, A Local Man, written by Bob Ellis and Robin McLachlan.